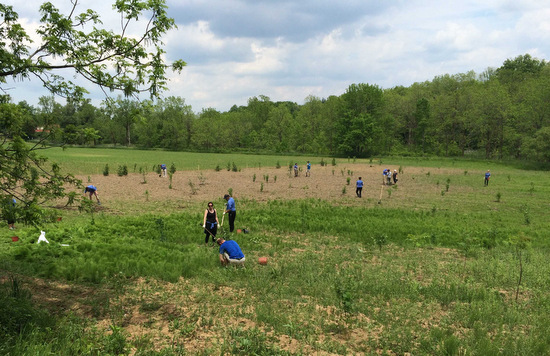 Over 30 staff from two RBC branches came together back in the summer on June 2nd to plant 170 large native trees and shrubs on a farm property in the Logies Creek Subwatershed within the Spencer Creek Watershed. The residents of the property had contacted the Hamilton Watershed Stewardship Program in 2015 as they had decided to retire a portion of their leased agricultural lands and allow for an accelerated regeneration and naturalization of 1.5 acres with a robust diversity of native plant species. The RBC staff’s time spent volunteering was invaluable to seeing this project through. Thank you to RBC not only for their staff time but also for their donation. The native plants that were purchased and planted will help to recreate a natural landscape that will provide wildlife habitat for years to come. It was a great day, and on the day, the Hamilton Watershed Stewardship Program and the Dundas Valley 50 Year Vision teamed up to coordinate this volunteer event. This entry was posted in Latest News on December 16, 2016 by tobytresidder.